Hey all!! 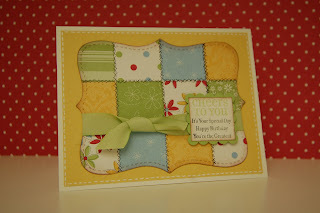 I wanted to share with you a card I made for Angie's birthday, my stampin' up demonstrator. I love this card!! I have quilted in the past but know I just don't have the time anymore to do such a big project. So when I saw this card I knew I had to make one. I can handle this kind of quilt. I found the card on Di's blog. It was so quick and easy. It took me longer to lay out the "quilt" than put it together. I really enjoyed making it. I can't wait to make more. So sorry for not blogging lately. I have so much to share with you. Thanks for stopping by and hope you come back. Have a great day!! lOve it!! We enjoyed having Cassie yesterday. Gabrielle's special day is March 24th. Does that day work for you? you did a fantastic job with that card... the colors and patterns and all! toooooo sweet! i will have to make one for sure!